Since we have the perfect body types for Shrek and Fiona the decision for what costumes to wear was easy! 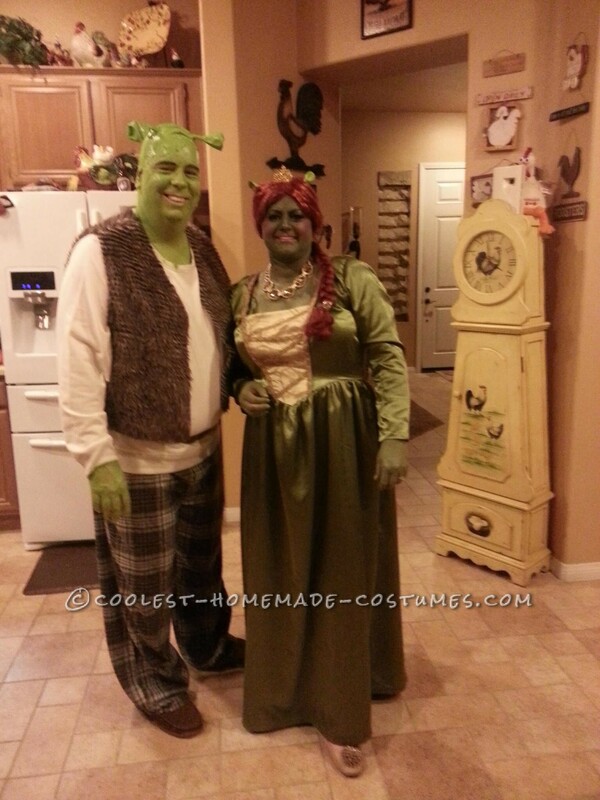 A couple’s Shrek costume and Fiona costume. I made Fiona’s dress using a Simplicity pattern, ordered the wig online and followed a tutorial on YouTube with step by step instructions how to do Fiona’s makeup. The make up was tricky, and the makeup on my neck and chest flaked off badly after a few hours. Not sure what I could have done differently to prevent this from happening. The Shrek costume was easy except for the headpiece with the ears, which was a challenge. His pants are flannel pj bottoms from Target, his top is an off-white sweatshirt from Wal Mart, his belt is from Wal Mart and his shoes are men’s brown corduroy slippers. I made Shrek’s vest out of fake fur and a Simplicity pattern. After looking at several other homemade Shrek headpieces online, I decided to use a latex swim cap with deflated latex balloons for the ogre ears. I stretched the swim cap over a volleyball to give it shape while I painted it. For the Shrek costume ears, I simply rolled some foil and slid it into the neck of two deflated latex balloons to keep the ears from flopping over and taped them to the top of the swim cap. I just pushed the end of the balloons inward to form the funnel shaped ogre ears. While the cap was on the volleyball, I applied latex pain all over the ears and cap with a sponge applicator. We used the same latex paint for Shrek’s face and hands over flesh toned face make up so the color would be consistent with the headpiece/ears. It was so much fun making Shrek’s headpiece together and were the talk of the costume party! We won the award for best costume again! My husband and I always try to do coordinating costumes. 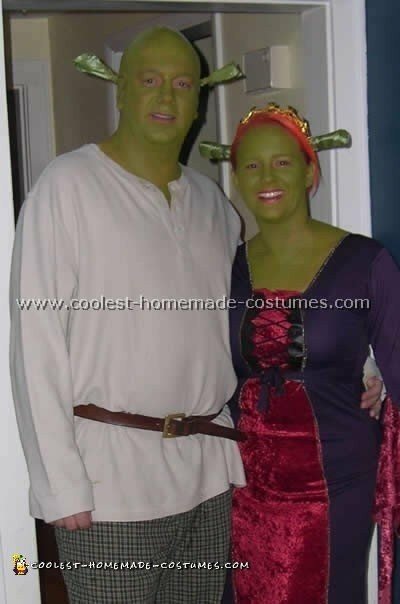 For a friend’s party we decided to go as Shrek and Princess Fiona. I bought my husband an oversized cream Henley shirt which he wore with his own plaid pajama pants. He also wore hiking boots and belt . I also made him a little vest out of a brown t-shirt but he forgot to wear it!. He topped the outfit off (literally!) with a bald cap and a headband that I had attached two green ‘ears’ . I had made the ears out of wired ribbon. I found a princess dress on the sale rack of a Halloween shop and attached my ‘ears’ to a plastic princess crown. After spraying my hair red we were ready for the real fun….the green make-up! People kept asking us where we got our costumes and were shocked when we said we made them ourselves. We won 1st prize for most original Shrek costume.